In the Ancient Greek poet Homer’s epic poem The Iliad, the motive for the siege of Troy by the Greeks was the abduction of Helen, wife of the red-haired Menalaus by the lascivious Trojan prince Alexandros. Yet Helen is strangely absent from Homer’s epic. The poem is more concerned with the mobilisation of Greece’s allies and the death, destruction and despair engendered by war. It is as though, the Helen myth is simply used to justify the wanton destruction of another people and the cultural superiority of the aggressors, who fight wars to protect women. Perhaps more than any other poem in the history of Western literature, Homer’s Iliad is a foundation stone, a constitutive ur-myth of European civilisation. One can find echoes of this ur-myth in the way the 15 year NATO occupation of Afghanistan is being represented to the French public. The occupation of Afghanistan is presented as an attempt to bring freedom and democracy to a backward and dangerous country populated by barbarians who are threatening the security of ‘Western civilization’. In particular, NATO is occupying Afghanistan, we are led to believe, to protect Afghan women just as Homer’s ‘doughty Achaeans’ invaded Troy to retrieve the beautiful Helen, rather than to rob and plunder another civilization. 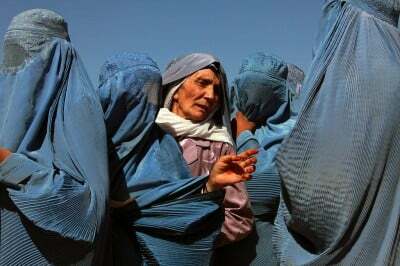 In the weeks before the Afghanistan invasion in 2001, television viewers were bombarded with images showing the plight of Afghanistan women under Taliban rule. No one can deny the horror and degradation that Afghanistan women suffered under the Taliban. But the television and radio mignons of the word’s corporate media outlets never explain how it came to pass that such draconian laws could be foisted upon a country in at the end of the twentieth century. Like Homer’s Helen, Afghanistan’s women remain passive and largely absent from the media narrative, and only become visible when we forget why we invaded the country in the first place. We are never told that Afghanistan women were once free and that it was we who put a brutal and ruthless end to their fledgling freedoms. We were never told that Women were free in Afghanistan long before Western intervention and that in fact it was Western intervention which enslaved Afghan women. The recommendations of this CIA report were clearly visible in the following weeks throughout the French media. The war on Afghanistan has consistently been portrayed in the French media as a noble attempt by ‘Western civilization’ to save the women of that country from the Taliban. In this fictional portrayal, French soldiers could be likened to Homer’s Greeks who are heroically attempting to rescue the beautiful Helen from brutal captivity of the Trojans. Before examining the recommendations of the aforementioned CIA report, it is necessary to dispel some common myths about women’s freedom in Afghanistan and the role of the West in ‘liberating’ them. For centuries Afghanistan was ruled by Shahs in a complex and changing feudal system that reached its apogee during the Duranni empire of the 18th century. During the nineteenth century Afghanistan became the battleground for the first round of the Great Game between the British Empire and Czarist Russia. Afghanistan fought three wars against the British. Although the British did manage to gain hegemony over Afghanistan, British victories against rugged and hardy Central Asian nation were Pyrrhic, with catastrophic casualties. Malalai is described by some as Afghanistan’s Joan of Arc. In the same year Abdur Rahmen Khan acceded to the Afghan throne. Abdur Rahmen initiated reforms allowing women to inherit property and the right to divorce. From 1919 to the early 1930s major advances in women’s rights were made under the leadership of King Amanullah Khan and his wife Queen Soraya. Queen Soraya set up the Anjuman-E-Himayat-E-Niswan (Organization for Women’s Protection) in 1920 which provided a platform for women to report domestic abuse. The first women’s magazine in Afghanistan Ershad-E-Niswan (Guidance for Women) was also initiated during this period. However, King Amanullah’s friendly relations with the Soviet Union conflicted with British geopolitical interests in the region. Khan’s liberal policies in regard to women of the Amanullah regime also made him deeply unpopular among conservative religious figures in the country. In an operation that would be repeated a century later, British intelligence agents succeeded in manipulating religious opposition to Amanullah and the progressive king was overthrown in 1929. The British found a suitable replacement for Amanullah in 1933 when they provided military assistance to the religious conservative Mohammad Nadir Shah to seize power in Kabul. Nadir Shah maintained power by pitching tribe against tribe in accordance with British divide and rule strategy and abolished many of Afghanistan’s pro-women reforms, unleashing a reign of terror against Afghanistan’s women. Britain’s puppet would become the template for future Anglo-American policy in Afghanistan: Keep the country under control by backing retrograde religious forces. The freedom of Afghanistan’s women would have to be subordinated to the interests of the British Empire in the region. With the rise of Mohammad Zahir Shah in 1933, Afghanistan’s women would see significant improvements in their social status. The first female secondary school was established in Kabul in 1941. Women were allowed to unveil from 1959 onward and in the 1964 constitution finally gave women the right to vote. It is worth noting that women in Switzerland did not attain the right to vote until 1977! In 1965 the Democratic Organisation of Afghan Women was formed to promote women’s rights in Afghanistan. Although women had the right to vote, the gains of modernisation were largely confined to Kabul. Women in the countryside continued to be treated as private property by the deeply backward tribes that held sway throughout the illiterate countryside. During the 1960s Marxist revolutionary ideology began to spread among educated intellectuals in Kabul culminating in the formation of the People’s Democratic Party of Afghanistan in 1965. However the party was split into two rival factions, khalq (masses) and Parcham (banner). Initially the People’s Democratic Party participated in the secular regime of Mohammad Doud Khan. However, matters came to a head in 1978 after the assassination of Mir Akbar Khyber, Marxist intellectual and leader of the Parcham faction of the People’s Democratic Party(PDPA). The PDPA initially believed that the Doud regime was responsible for the assassination of Khyber. Many members of the Parcham faction would later claim that the assassination had been carried out at the behest of Hafizullah Amin, the US educated leader of the Khalq faction who many suspected to be working for the CIA in order to weaken the communist movement from within. At the funeral of Khyber, thousands of PDPA supporters shouted anti-CIA slogans. The Doud regime feared a popular uprising and proceeded to arrest PDPA members. The PDPA, fearing for their lives, seized power on the 27th of April 1978 what became known as the Saur Revolution. Women’s rights were high on the national, democratic agenda. The democratic government introduced a radical education programme for women. This angered the traditional mullahs in the countryside and women often had to go to school with a book in one hand and a gun in the other in order to protect themselves from attacks by reactionary misogynists. The communist regime invited Soviet contractors and engineers to build roads, schools and hospitals. Soviet geologists discovered vast quantities of lithium and minerals in Afghanistan; vital resources which the democratic government intended to exploit in the interests of the entire nation. Women played a key role in the new administration in Kabul. Kabul University became a hotbed of modernity. Up to fifty percent of Kabul’s university students were women during the 1980s. Thousands of women enrolled in the armed forces and there were 7 women in parliament. Young female students roamed the streets of Kabul in denim flairs and t-shirts, dating men of their own choice. Some people spoke of a golden era. A Soviet stooge or Non-aligned State? The Soviet Union had itself abandoned socialism and proletarian internationalism with the Khrushchevite reforms of 1957, which restored the capitalist mode of production. Although the Soviet Union was quick to supply 104 million dollars in development aid to the new regime, Western development aid was significantly higher at 121 million, half of which came from the World Bank. The Kabul regime signaled its willingness to maintain friendly relations with the United States and the US increased aid to 300 million dollars. US Secretary of State, Cyrus Vance claimed that there was ‘no evidence of Soviet complicity in the coup’. Both the Assistant Secretary of State for Near Eastern and South-Asian Affairs Harold Saunders and Undersecretary of State for Political Affairs David Newsom, felt that the Afghan regime was independent from Moscow. They struck me as very ideological but they were still Afghan nationalists. My assessment was that we were dealing with a regime that hadn’t found itself. There were divisions in it and it was still on probation in Soviet eyes. I felt it was justifiable to keep what assets we had and to continue a holding action, a monitoring action.” This was also the position of the US ambassador to Afghanistan Adolph Dubs. However, Carter’s National Security Advisor Zbigniew Bzrezinski was determined to take covert military action against the Kabul government and remove US diplomatic presence from the country. US aid was finally cut off after a group of right-wing Islamists murdered the Adolph Dubs, the US ambassador to Afghanistan. The terrorists had kidnapped Dubs in order to blackmail the Kabul government for the imprisonment of right-wing Islamists. Dubs was killed in the ensuing shootout between the terrorists and the Afghan military. The United States government blamed Soviet advisors to the Kabul government for failing to rescue the US ambassador. The prospect of a communist regime spreading all the way to the oil-rich Persian Gulf sent shock waves through the Anglo-American oil oligarchy. Anglo-American control over Afghanistan would have to be established once and for oil. The result was the Carter Doctrine of 1980, which was drafted by US National Security Advisor Zbigniew Bzrezinski. The region which is now threatened by Soviet troops in Afghanistan is of great strategic importance: It contains more than two-thirds of the world’s exportable oil. The Soviet effort to dominate Afghanistan has brought Soviet military forces to within 300 miles of the Indian Ocean and close to the Straits of Hormuz, a waterway through which most of the world’s oil must flow. The Soviet Union is now attempting to consolidate a strategic position, therefore, that poses a grave threat to the free movement of Middle East oil. Bzrezinski’s plan was to create an ‘arc of crisis’ around the Soviet Union, drawing it into internecine conflict with Wahhabi terrorism. The ‘economic sacrifice’ was to be paid by the Afghan people when the CIA supplied finance and weapons through their allies in Pakistan, China and Saudi Arabia. The Afghan ‘resistance’ fighters against the ‘soviet puppet’ in Kabul were composed of illiterate peasants fighting under local lords. Pakistani Inter-Services Intelligence, under the direction of the CIA, provided terrorist training to the Afghan Mujahedeen. Rural lords and tribes men had opposed the pro-feminist policies of the Kabul regime. They also resented the agrarian policies of the government which redistributed land to the poor. The tribesmen’s opposition to social equality was music to the ears of the US government, who would send the CIA to help them regain power. The CIA used its contacts in Saudi Arabia to recruit a young man by the name of Bin Laden, coded named Tim Osman, to finance and co-ordinate terrorist cells in Afghanistan. Like the Vietnam War, CIA terrorism was again largely financed by narco-traficking. It was a blunt example of Carter’s ‘political wisdom’. Afghan women would pay a heavy price as the US government spread fanatical Saudi-sponsored Wahhabi ‘Islam’ throughout the besieged Afghan state. Text books with violent terrorist images were printed in Nebraska University in the United States with funding from the US government. Thousands of Madrasas were set up in Pakistan to train terrorists for the US funded jihad against democratic Afghanistan. In short violent, misogynistic ‘jihadism’ was a creation of US foreign policy. The much mediatized notion that Western civilization is being threatened by ‘islamist fundamentalism’ is a gigantic lie. Rather, Islamist Jihad in its modern form was and still is a creation of Anglo-American, Zionist intelligence agencies to serve their foreign policy objectives. Reinstating the ruling tenets of British imperialism since the nineteenth century, the support for retrograde elements in Afghan society enabled the United States to destroy the secular institutions of the pro-feminist Democratic Republic of Afghanistan. Western policy makers realized that in a country of extreme poverty, Marxist ideas flourish and Marxist ideas threaten the control of the world’s resources by Western oligarchs. A backward society controlled by Wahhabi clerics could easily be bribed and corrupted to serve Western interests. If such a society systemically brutalized its women, the West could use this to blackmail its client rulers in the name of ‘human rights’ in the pursuit of Western economic and imperial interests. In other words, Islamic fundamentalism would become a vital component of the expansion of Western imperialism. The US funded war was to take the lives of millions of Afghans and thousands of Soviet soldiers. Afghanistan’s experiment in popular democracy came to a tragic end in 1992 with the fall of the Democratic government in Kabul. After the collapse of the Democratic Republic of Afghanistan chaos reigned throughout the country. The waifs of the US-funded madrasas who had been brainwashed into the most extreme and distorted form of Islam in history, wandered the country. These madrasa students became known as the Taliban. The rise of Benzir Bhutto in Pakistan in 1993 paved the way for the Taliban takeover of Afghanistan in 1996. Bhutto’s gender and belief in ‘democracy’ did not prevent her from approving financial support to the most violent misogynists in modern history. The policy of the Clinton administration at the time was that the Taliban regime might be in US interests. We didn’t read much about Taliban atrocities during the Clinton years. On 2 November 2007 Benazir Bhutto stated to David Frost on Al Jazereera television that Bin Laden had been killed by Omar Sheikh Mohammad, whom former Pakistani dictator Pervez Musharraf claims was recruited by MI6 as a student in the London School of Economics to serve in the Bosnian Muslim jihad against the Yugoslav government during the 1990s. Bhutto had potentially blown another myth behind NATO’s Afghan adventure. She didn’t live to repeat it. She was assassinated on the 27 December 2007. In 1977 the Revolutionary Association of the Women of Afghanistan was formed under the leadership of Meena Kewshwar Kamal. Although much as been made in the West of Meena Keshwar Kamal’s contribution to women’s rights in Afghanistan and their heroic work highlighting abuse of women since the arrival of the Taliban, RAWA was from the start, a counterrevolutionary organisation that would vociferously oppose the progressive polices of the Democratic Republic of Afghanistan. While RAWA stands for women’s rights, it does not support social equality. Sharing the same rabid anti-communist Weltanschaung, as US National Security Advisor Zbigniew Bzrezinski, Meena denounced the DRA from the start as a ‘Soviet stooge’. Meena hoped for a comprador bourgeois parliamentary democracy where existing class structures would not be threatened. Her bourgeois version of feminism gained her generous support from the anti-communist government of Francois Mitterand in Paris. In 1981 she was invited to Paris to attend the French Socialist Party congress. She travelled Europe meeting with government officials. Meena received support from Trotskyists in France and Britain from the Ligue Communiste Revolutionaire to Ernest Mandel’s United Secretariat, the International Socialist Organisation, Socialist Workers Parties as well as various anarchist organisations and publications. In 2002 Sonali Kalhatkar interviewed the current leader of RAWA Taheena Faryal for the magazine Znet. In that interview Frayal made a number of highly dubious statements coming from someone who claims to be on the left. Faryal believes that the democratic government was not interested in education, in spite of the fact that it introduced the most ambitious education programme in the country’s history. If they support us with our policies of being anti-fundamentalist, for democracy, for freedom of speech, freedom of expression, freedom of belief, for human rights and women’s rights and obviously we have always exposed the countries who’ve supported this or that fundamentalist group in Afghanistan, then I don’t think that we would mind if they support us with all of our policies, but I don’t think that would be possible. So here we have a leftist revolutionary who believes that the US oligarchs might be willing to promote democracy! In the same article this ultra-left revolutionary welcomed World Bank corporate investment once the US had helped the country to defeat the ‘terrorists’. Faryal said that RAWA would accept US funding provided the organisation is not forced to change its policies. Given the fact that RAWA was formed to oppose communism, it is unlikely that the US government would be interested in changing their policies. On the RAWA website, it is claimed that Meena was killed by the KGB. However in 2002 Zmag interview, Faryal claimed that Meena was killed by Hulbuddin Hekmatyar. She neglected to mention that Hekmatyar was on the CIA payroll! It is much more likely that Meena was killed by Hekmatyar, given his record of through acid in women’s faces. ‘Meena. She fought and died for the Freedom of Afghan women’ Meena, the bourgeois reactionary feminist was eventually hoist by her own petard when the CIA’s favourite psychopath Hekmatyar had her killed in 1987. Few leftist organisations have questioned the rationale behind RAWA’s opposition to the pro-feminist DRA. All of them have perpetuated the myth that the Soviet invasion was the cause of the conflict in the country. None of them ever questioned RAWA’s commitment to equality. None of them ever asked why she did not know about US support for the Mujahedeen psychopaths. No one ever asked why she was wined and dined by Western governments as they covertly backed Bin Laden and the Islamic fundamentalists against the progressive government in Kabul. Instead all these organizations strengthened the imperialist propaganda war for intervention in Afghanistan.The fact of the matter is that the Soviet Invasion of Afghanistan in 1979 was no different to the landing of the Allies in Normandy in 1944. Afghanistan was already under occupation by agents from Pakistan in the service of the CIA , who were murdering innocent civilians throughout the country. It is true that the Soviet Union under Brezhnev was a corrupt edifice with highly dubious internationalist and democratic credentials. It was also true that the invasion played into the hands of the CIA who wanted to give the Soviet Union its own Vietnam. Nevertheless, the Republic of Afghanistan brought tremendous hope to Afghanistan’s illiterate poor and to oppose its defense was to oppose the defense of national liberation and democracy. Unfortunately, Socialist Albania, where women enjoyed the highest freedom of any country, and whose analysis of Soviet and Chinese social imperialism was correct, failed to understand the class relations in Afghanistan and lent its support to CIA-fomented counter-revolution. There is a difference between invading a country to help that country drive out another invader, and invading a country to oppress its people. This is a distinction that Noam Chomsky has made in the past when justifying the allied invasion of France in 1944. But he has refused to do so with regard to the Soviet invasion of Afghanistan in 1979. One of the founding members of this new democratic era in Afghan politics Anahita Ratebzad; this women has virtually been erased from Afghanistan’s history. Anahita Ratebzad had the privilege of a good education under in the post war period when Amanullah Shah opened the French Malalai lycée in Kabul for girls. Ratebzad went to train as a doctor in Kabul University before becoming a Member of Parliament along with three other women in 1965. Privileges which women, by right, must have are equal education, job security, health services, and free time to rear a healthy generation for building the future of the country … Educating and enlightening women is now the subject of close government attention. In 1986, Anahita Ratebzad hoped to travel to the United Kingdom for talks with the British Prime Minister Margaret Thatcher. The fact that Thatcher was a woman didn’t waiver her rabid anti-communist fanaticism. Her support for the misogynist Mujahedeen was absolute. We do not regard the Karmal regime as a legitimate regime. It would not, therefore, be appropriate for Dr. Anahita Ratebzad, as a senior member of that regime, to visit this country. If the Karmal regime were sincere about peace it would open the way to progress in the United Nations negotiations by agreeing to the withdrawal of the 118,000 Soviet troops currently occupying Afghanistan. There was no mention in the British prime minister’s haughty response to the UK and CIA backed terrorism of the Mujahedeen against the Democratic Government of Afghanistan, nor did she care about the atrocities being carried out against Afghan women by Mullahs trained by the SAS. The CIA’s intervention in Afghanistan eventually led to the fall of the Afghan democracy in 1992. Anarchy and chaos reigned before the arrival of the Taliban in 1994. The Taliban found favour with the Clinton administration as they seemed open to US oil-pipeline plans for the country. The story should be simple enough for the average citizen to follow. Afghanistan’s women were reduced to serfs thanks to Western support for their oppressors. But telling the truth about women in Afghanistan would undoubtedly ruin the ‘Homeric heroism’ of our NATO battalions in ‘barbarous’ Afghanistan. passive French and German dislike of their troop presence could turn into active and politically potent hostility. The tone of previous debate suggests that a spike in French or German casualties or in Afghan civilian casualties could become a tipping point in converting passive opposition into active calls for immediate withdrawal. messaging that dramatizes the potential adverse consequences of an ISAF defeat for Afghan civilians could leverage French (and other European) guilt for abandoning them. The prospect of the Taliban rolling back hard-won progress on girls’ education could provoke French indignation, become a rallying point for France’s largely secular public, and give voters a reason to support a good and necessary cause despite casualties. The CIA strategy to mask the horror of NATO’s murderous occupation was subsequently widely bruited in France. The story of Aisha, the Afghan woman, whose nose was cut off by the Taliban, featured in France’s popular magazine Paris Match and other mainstream publications. The Paris Match headline read ‘Le Visage Retrouvé’- the recovered face. The Aisha story also appeared on the Paris Match website about the report of another French soldier killed in action in Afghanistan. The story of Aisha, whose nose was replaced by American military surgeons, received generous coverage in France, and the CIA has been working assiduously in France ever since to raise awareness about the plight of Afghan women. Given the timing of the CIA report, it was perhaps not incidental that the French government were at this time highly concerned about highlighting the importance of banning the burqa , and that the Al Qaeda terrorist threat had reached an all time high in France . Al Qaeda have an uncanny tendency to resurface just at that point when wars to exterminate them become unpopular. Pushing the debate on whether or not to ban the burka enables the French military industrial complex to justify its military occupation of Afghanistan on ‘humanitarian’ grounds. The burka debate focuses one’s mind on the fact that France opposes the oppression of women and that is why French troops must kill and die in Afghanistan. The scale of destruction wrought on Afghanistan since the NATO occupation is rarely discussed in the European media. We are never told, for example, that groups opposed to the Taliban were also vociferously opposed to the NATO occupation. We are never told that over 90 percent of Afghan women now suffer from depression, over eight percent of Afghan men have serious mental problems; over 30 percent of Afghan children have to work. We are never told by the mainstream press that since the invasion the plight of women has worsened considerably. More children under 5 die in NATO occupied Afghanistan than NAZI occupied Poland. The fairy tale that NATO forces have invaded Afghanistan to protect the ‘Afghan people’ from the cruel Taliban is rarely debunked. By creating the Taliban and Al Qaeda, western imperialists had a perfect pretext to effect a long term redivision of the world that would entail permanent genocide under the guise of permanent Western ‘humanitarianism’. Henceforth, the bombing, mutilation and enslavement of women in Western occupied countries would be presented as their liberation. Since the French engagement in Afghanistan in 2001, 88French soldiers have been killed. It is in fact this relatively small number of French casualties rather than the holocaust which NATO has imposed on Afghanistan which is the cause of the French public’s apathy towards the war. The French establishment which vaunts the heroism of the French resistance against NAZI occupation during World War II does not see the irony in referring to the Afghan resistance as ‘terrorists’. The history of Western intervention in Afghanistan shows that the West has been the source of the oppression suffered by Afghan women. By arming and indoctrinating illiterate Afghan peasants with anti-communist fanaticism during the 1980s, the West created a nightmare for the women of Afghanistan. The French government of Mitterrand colluded in this crime against humanity. Now France is again complicit in war crimes. This is why people like Anahita Ratebzad must remain unknown; this is why Afghanistan’s history of women’s liberation must be veiled.